Touring the country and getting paid to make others laugh may sound glamorous to some. The reality is far different, according to Brad Sherwood. Sherwood, of Whose Line Is It Anyway? fame, joked during a recent phone interview that life on the road is much more mundane than people assume. But that does not stop him from envisioning a picturesque arrival from city to city. "I'd like to think that we ride in on a carriage along the river. Sometimes we'll get a warm cookie at the Double Tree (hotel)," Sherwood deadpanned. Sherwood and his former Whose Line co-star, Colin Mochrie, return Saturday to the State Theatre in Easton. "Fans who've seen our show, they know they're in for a treat. Even if you've seen the Mouse Trap game, everything else is going to be wild and wacky," he said. 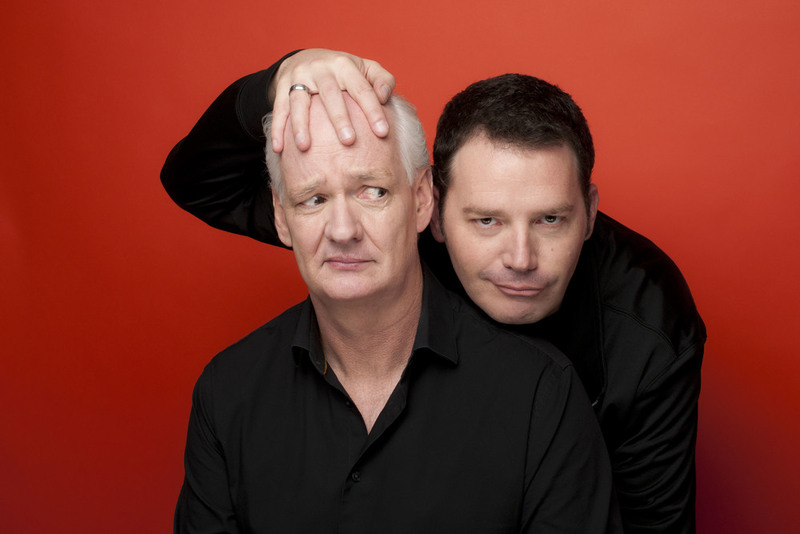 Sherwood and Mochrie have been performing as a duo since 2002. Their show has become a frequent, and popular, State Theatre attraction. "I think the most important thing is people just come out and have a good time," he said. "We all go on a journey together." Performing improv comedy, Sherwood said, gives he and Mochrie a slight advantage over traditional stand-up comedians and even musicians. The unscripted, impromptu nature of the performance make for a unique experience for the audience, he said. Sherwood said each joke is one that has to be planted, with the the hope that it grows into something funny. "We kind of say, 'Here are the keys. Take us wherever you want to go and we'll try to make it a funny trip'," Sherwood said. "It doesn't get boring because the show is never the same twice ... Each night is a discovery because it's a totally different audience." Sherwood said the difficult part of performing improvisational comedy on television was translating the live theater experience in front of the cameras. Sherwood said he and Mochrie's experience on Whose Line -- both were cast members of the American version of the series, while Mochrie appeared on both the American original British versions -- made the transition back to theaters easy. "We had the formula, knowing it was going to work. We had to figure out a way to give that power to the audience," he said. Sherwood said he and Mochrie do not intend on putting their show to bed in the foreseeable future. He said they would like to travel abroad more, though they have already performed in London, India and Australia. Improv comedy is universal and audiences, stateside or overseas, can relate to the humor, Sherwood said. "Because improv is not based in being sarcastic, which a lot of stand-up is, we are able to put ourselves in unusual situations and try to climb out of them," he said. "(With stand-up), there are two different chasms of what people find funny, whereas we can go pretty much anywhere. It's situational and is always going to be made up on the spot." Sherwood, who has been performing improv for 25 years, said he is still amazed that his job is to travel the world and make things up for laughs, one he does not take for granted. "This occupation didn't exist when I was a kid," he said. "It's really cool to be at the forefront of, 'Hey, this is an actual occupation. That's kind of a fun realization." He said fans often suspect Sherwood and Mochrie are going off of memorized scripts on stage. Sherwood said that could not be further from the truth. Sherwood compared improv to that of a having a conversation with another human being, particularly during a car ride. He said improv boils down to a matter of honing instincts. "Every single moment on stage is unexpected," he said. "Improv, in a certain sense, is the funny version of how everybody's brain works all the time ... The thought process is already there and instantaneous for every single one of us. Every moment is improvised, unless you're working on a factory line, putting the same thing in a box for eight hours." Sherwood and Mochrie's performance on the main stage will be preceded by a stand-up comedy showcase featuring local comedians Tyler Rothrock, Jason Brown and Glen Tickle. The pre-show, hosted by Nate Marshall, will take place in the Easton Hospital Gallery. It is free for Sherwood and Mochrie ticket holders.